November means the 2015-16 huntin’ season is in full swing. In this month’s column, I cover the high points of what you need to know about general gun, fall turkey, quail, snipe and the second phase of mourning and white-winged dove season. The first thing you need to do is pick up a $17 Florida resident hunting license. Nonresidents pay $46.50 for a 10-day license or $151.50 for 12 months. If you plan to hunt one of Florida’s many wildlife management areas, you’ll also need a $26.50 management area permit, but don’t forget to study the brochure for the specific area you plan to hunt, because dates, bag limits and rules can differ greatly from area to area. You can get these brochures at the tax collectors’ offices in close proximity to the WMA, or you can download them from MyFWC.com/Hunting. You can buy your license and permits by calling 888-HUNT-FLORIDA or going online at License.MyFWC.com. Have your credit card ready. You also can purchase them from a tax collector’s office and most retail outlets that sell hunting and fishing supplies. The general gun season runs Nov. 7 – Jan. 24 in Zone C; Dec. 5 – Feb. 21 in Zone B. In Zone A, the second phase of general gun season runs Nov. 21 – Jan. 3. In Zone D, it always starts Thanksgiving Day (Nov. 26) and lasts four days until Nov. 29. Two weeks later, the season reopens Dec. 12 and runs through Feb. 21. On private lands, hunters can take wild hogs year-round with no bag or size limits. On most – but not all – WMAs, there’s also no bag or size limit on wild hogs, and hunters can take them during any hunting season except spring turkey. Again, check the WMA brochure to be certain or the above website. Within the general gun season on private lands only are the highly anticipated antlerless deer days, better known to us hunters as “doe days.” But note these dates have drastically changed this year and differ for each of the state’s new 12 deer management units. To learn when these antlerless deer opportunities occur in your DMU, please refer to the “2015-2016 Florida Hunting Regulations” handbook that you can pick up at your tax collector’s office, FWC regional office or download the “Hunting Handbook” online at MyFWC.com/Hunting. During antlerless deer season, the daily bag limit is one legal buck and one antlerless deer, or two legal bucks. You may not take two antlerless deer in one day like you can during archery season, and spotted fawns are never legal game. 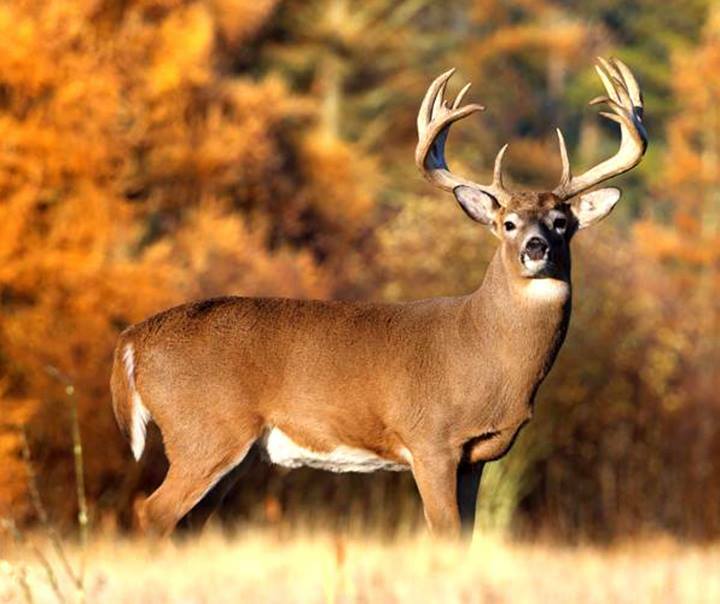 By the way, WMAs do not have an antlerless deer season, so this opportunity applies to private property only. Fall turkey season in Zone A is Nov. 21 – Jan. 3. In zones B it runs Dec. 5 – Jan. 31. Zone C is Nov. 7 – Jan. 3. Zone D fall turkey season is Nov. 26-29 and Dec. 12 – Jan. 17, except for Holmes County, where there is no fall turkey season. Only bearded turkeys and gobblers are legal game; you must have a turkey permit ($10 for residents; $125 for nonresidents) to hunt them. You may take up to two turkeys in one day on private lands, but there’s still the two-bird fall-season (archery, crossbow, muzzleloading gun and fall turkey seasons combined) limit. And on WMAs, you still may shoot only one turkey per day. Quail season runs statewide Nov. 14 – March 6, and the daily bag limit is 12. Shooting hours for deer, turkey and quail are a half-hour before sunrise to a half-hour after sunset. All legal rifles, shotguns, muzzleloaders, bows, crossbows and pistols are legal for taking these resident game animals during the general gun, antlerless deer, fall turkey and quail seasons. Snipe hunting in Florida ranks second in the nation in number of birds harvested each year, and the season always runs Nov. 1 – Feb. 15 statewide. The second phase of the mourning and white-winged dove season also comes in this month and runs Nov. 14 – Dec. 7. Shooting hours for migratory game birds are one-half hour before sunrise to sunset. The bag limit for snipe is eight; for doves, the bag limit is 15. You must get a no-cost migratory bird permit if you plan to hunt snipe, doves or any other migratory game birds. The FWC provides an online “Dove Hunters’ Hotline,” which gives up-to-date information on Florida’s public dove fields. The address is MyFWC.com/Dove, and it is updated every Thursday throughout dove season. Information includes dove densities, previous week’s harvests and field conditions. Whether enjoying the camaraderie of hunting with friends and family or relishing the solitude of hunting solo, November is the perfect time to appreciate Florida’s abundant wildlife populations and great hunting opportunities. Here’s wishing you a happy Thanksgiving and a successful hunting season.